Today’s post originally appeared on the blog, Sean’s Ramblings Blog. It is a PERFECT Guest blog post! Watch the Heinz Ketchup Commercial from the Super Bowl. No REALLY.. watch it! Am I the only one who notices something wrong with the commercial? Everyone in the commercial hits the bottom of the bottle to get the ketchup out. Growing up in Pittsburgh, I learned at a young age the proper way to effectively get ketchup out of a Heinz bottle. You tap the 57. This might have been part of the first grade curriculum. Heinz even writes this ! What’s the best way to get Heinz ketchup out of the iconic glass bottle? 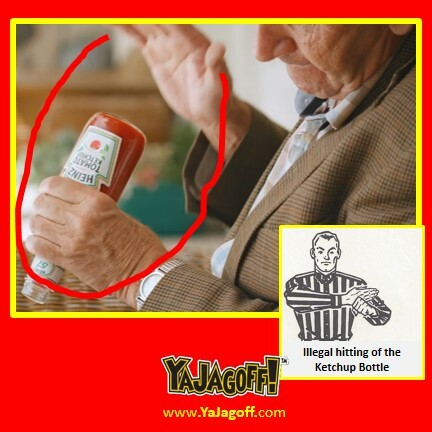 While Heinz may have spent $4 million on the TV spot, perhaps they should have spent the $0 to tell the marketing people the right way to get ketchup out of the bottle… YA JAGOFFS! Thanks to Sean for offering to re-post his blog post here. Follow him on his website and on Twitter @SeansRamblings.